I just wanted to email and let you know that last nights show was great!!! You did an amazing job and all of the children are so great due to your great teaching and kind heart! I know they all left last night with a huge boost in confidence. I'm so glad Aiden decided to join your studio! We really appreciate all you do! Tonight was Kealing's spring band concert. Will was recognized as the "Most Improved" Jazz Band member and received accolades for being one of the few 7th graders to be named to Jazz Band and for playing such a prominent role as the band's drummer. We know your instruction has helped Will improve leaps and bounds and will continue to do so, so thank you for helping him along and making music fun and engaging. We look forward to this summer allowing him more time to play drums! My daughter, Alyssa Willis, is one of David Mendoza's students. I cannot tell you how pleased I am with my daughter's progress. She is a very musical young lady (piano and violin), but because she has come a long way playing the drums in such a short time, the drums have become her passion. This is due to David's lessons. He is a dedicated instructor who has taken the time to accommodate my busy schedule. My daughter had her “First Audition” with David and several of his students. It was not what she expected. It was better than she expected! She was content just to be included in this event. She left with a sense of accomplishment, and more importantly, with a smile on her face. David is an amazing instructor and I would highly recommend him to anyone who is interested in taking drum lessons. I was very intrigued to read about “First Audition,” and I can honestly say what a great idea that is! The fact alone that you are exposing young musicians to that sort of experience is awesome; not to mention the fact that you’ve got Austin session players on-board to be part of it. . . . I wish someone had exposed me to a situation like that when I was younger! In any case, we can certainly help out with your events, and I will be glad to send you a box of goodies (including a banner!) for your usage in these events. I will be sending it to your home address. Assistant Director of Education, Vic Firth Inc.
Alex rocked the talent show! I am still getting compliments from the parents and teachers who were amazed by his talent. His friends were blown away and Alex was really proud of himself (especially after he saw the three other drummers that performed)! I think he would perform every week, if he could. Thanks for always supporting Brett and being such a terrific teacher and mentor to him. I truly believe that the reason Brett looked so happy at his concert was because of your teaching, insight, advice, encouragement, energy and passion for drumming gave Brett the preparedness and confidence to just PLAY and enjoy the moment. Brett IS normally a quiet and unassuming boy but he does have another side to him that you've helped draw out, which I think is very, very cool. Also, it meant the world to Brett that you were there to support him. (And it's not lost on either family that the fact that TWO of your students DROVE the show speaks volumes about the effectiveness of your teaching and skill with the kids.) Will Brett stick with it? YOU KNOW IT!! We are just thrilled with your lessons! Clayton is enjoying learning to play and I hope he is soaking it all in. I am happy to be learning the vocabulary and philosophy of the drum set. I think the way you combine fundamentals with fun is extraordinary. I also appreciate the materials that you prepare for Clayton. Let’s hope he can continue the enthusiasm. Thanks so much – the video is awesome! I’ve already shown some people here at work – lots of jaws dropping around here. I told them that your lessons have helped her find a real joy in her life. I appreciate your kindness and patience with her. Your encouragement and praise are so important to her. Melinda will be there with Anna. Melinda has been a professional teacher for 21 years and is very impressed with your teaching skills and methods. And Anna feels so comfortable with you. Anna LOVED it. She has been so happy practicing and showing off what she can do. I'm very proud of her. And great teaching. You knew exactly how to motivate her. She seems to get a lot of enjoyment playing. It is definitely a stress relief. It is easier to get her to play her drums than her guitar. I'm also happy she has you as a role model. There are very few male role models in her life, so I'm happy when she has a positive model. Greetings from Pahu International. I recently viewed a video of you teaching elementary school children about playing the drums. I wanted to thank you for that as educating our young people about the creative arts and especially the art of drumming is very important. With all the budget cuts in our school programs these children have limited resources to live performances. I know that I was inspired to play the drums as a result of an assembly that took place at our elementary school back in the day. You have an impressive resume and musical history and I admire the path you have chosen becoming a well rounded music educator and performer. We appreciate your support as a fellow drummer and may be able to include you in our endorsement program and promotional events calender. Keep up the great work your doing, its awesome. Go to WWW.PAHU INTERNATIONAL.COM to check out our products. It was a pleasure meeting your wife and family; they helped make me (and others, I'm certain) a little less nervous about our 'first auditions.' I'm sure a lot of work goes into putting on such a well organized event like this. Thanks for all the work to make it a priceless experience for us novice drummers! I have known David Mendoza for over six months in the capacity of my son's drum instructor. In those six we have come to appreciate his knowledge of drumming, the structure of the lesson and the quality of care put into each student. David has had many years of instruction himself so he can use his experience of being taught to design a many faceted lesson plan for each student. He takes into consideration the skill and experience of each student and designs a lesson plan totally adapted to each student, instead of a mass production mind set where everyone learns at the same speed and the same music. The correspondence is real time and constructive. His use of email and the internet incorporates well with his style of teaching. 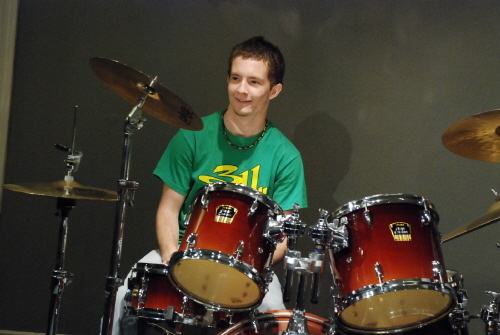 He recently designed and implemented a workshop for his drum students called "First Audition". He and an instructor of guitars had their respective students first learn specific songs and then get together at this workshop and play the songs with each other. This was such a valuable experience for the students on many levels. They got to meet fellow music enthusiasts, gained experience playing with musicians that they had never played with before, and realized that there is room for improvement in themselves!!! This concept I believe is very helpful to budding musicians and David implemented it at the right time in their instruction and with the right size group. A lot of thought went into this workshop and it was apparent. I have watched David's drum instruction business take off over the past six months. I believe he is a person who, when he puts his mind on something, gives it his all to strive for success of the project. As of October Audrey has been taking drum lessons with you for a year. It is really exciting to see the progress she has made from simple drum grooves to playing Bob Seger’s Old Time Rock & Roll. We bought her a drum set with the understanding that she would join the band in Middle School. She is now expanding her musical experience with the saxophone. She is taking private sax lessons and her instructor was very excited after the first lesson because she was able to read the music and displays some natural musical ability. 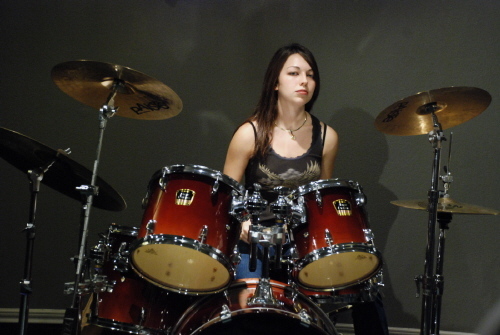 I know that her knowledge and confidence comes from taking drum lessons at Oak Hill Drum Studio. Thank you for everything you have done for Audrey. We are looking forward to seeing you next week for lessons! I have checked out your site and was showing it to my wife last night. Man, what a great job you are doing with your teaching practice!!! The whole “First Audition” idea with the pictures and videos is fantastic! I mean it’s all about playing with a band and you are definitely giving your students a valuable and I’m sure fun experience. I also really enjoyed your playing on the video!! Well, I've got nothing but good things to say about the progress of my lessons. I feel very fortunate to have found a teacher that has taken a sincere interest in my musical aspirations. I know I have improved immensely since I began taking lessons from you, and my confidence in my drumming abilities has skyrocketed. I believe this is because you really understand the goals I have set for myself and encourage me not only to reach them, but to surpass them and set increasingly higher goals -- ones which I would have never thought possible at the start of my lessons. It is evident that you are not just going by a standardized lesson plan, as was the case with my past teachers. Your attention to each of your students’ needs and capabilities and your endless encouragement has allowed us all to perform at our highest potentials, as was apparent from the gathering on Saturday. Also, your generosity with not only your equipment, but your knowledge of music and talented skills is something which I am immeasurably thankful for. I very much enjoyed First Audition! I thought it to be a fun learning experience. The overall mood was one of motivation and support and it was a great pleasure to meet your other students as well as the many gifted musicians who attended the session. What I really liked about it was that we got to play the songs we had prepared beforehand as well as some which we were less familiar with. I think that this set up served as an accurate representation of the auditions which I hope to be attending in the future and the experience has helped me to know what to expect from an audition and how to perform. Overall, First Audition was a lot more relaxed and much more structured than I had expected, which made me feel less nervous about drumming in front of a group of people for the first time. I think it’s great way to get people acquainted with the structure of bands and live performances. Good luck and thanks for everything! Hope the letter’s not too long. I’ll see you sometime next week! Thank you very much! I appreciate all of your help. I will pick up a practice pad so that Treavor and I can practice together at home. That should help him with rhythm and I will also keep him on track with using the metronome as well. I can’t express how happy I am with the way Treavor’s classes are going. He is inspired and it makes me so happy to see him want something so much. It is a testament to your skill as an instructor! Treavor has been practicing and I have started to save for his official drum kit. Thank you so much for being such an inspiration to Treavor. I see him blossoming under your expert instruction. Your patience with Treavor and confidence in his abilities has made all the difference in his experience. I am so thankful to you for all that you have done for Treavor and will gladly refer anybody to you I hear may need a good drum instructor. Again, thank you from the bottom of my heart. Chase has been taking lessons from David for about 3 months now. The progress he’s made is remarkable. David is able to teach by example. He sits at a drum set directly across from his students, who are also at a drum set. This makes it much easier, especially for younger students, to play what he shows them. Aside from being a great teacher, David is very personable. He always compliments his students, and never puts them under pressure. He’s easy to talk to and asks for any criticism parents may have. We’re very happy we found such a knowledgeable and devoted musician to help Chase fulfill his goals. David Mendoza has provided my son Garrett with drum lessons. 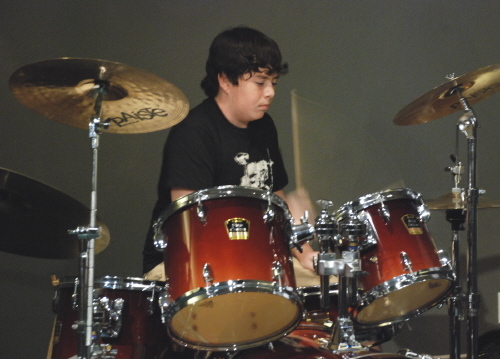 My 8th grade son is now confident enough in his drum studies to venture out to play music with other student musicians. David has repeatedly gone that extra mile in making the lessons enjoyable but at the same time maximizing the learning. We highly recommend his teaching style. 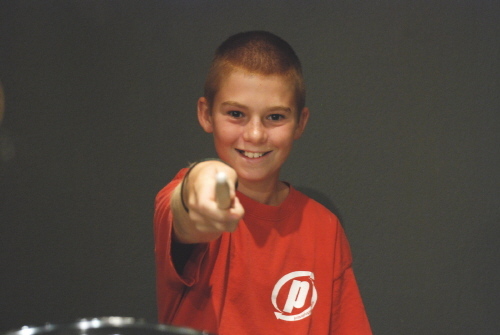 When my son, Jacob, told me he wanted to learn to play drums I thought it was a phase he was going through. He persisted. David Mendoza told me he would know after 3 lessons whether it would be worth our while to pursue this. I appreciated his honesty and we gave it a go. Four months later Jacob recognizes and is learning to play drum beats from his favorite songs. He loves going to lessons! David is patient when something is difficult to master and quick to praise when it is right. I would recommend David to everyone who wants to learn. Alyssa is really pumped about the lessons and really likes you. Thank you for what you are doing; I will recommend you to anyone else wanting lessons. Thanks so much for working with Drew on the TNT song. It's very impressive that you are able to break down the song and teach him in a short period of time. And I appreciate your patience. Hopefully he can do the next First Audition when it becomes available. He just turned 9 a couple days ago. He's excited about playing songs. Sign up for lessons online!